RingCentral is an established business VoIP provider, that has expanded outward from their core subscriber base of SMBs to include very advanced features for enterprise consumers and smaller plans for solopreneurs and microbusinesses. eVoice has always catered to smaller businesses. So, will a provider be better able to serve its customers if they hone their practices in one area, or if they have a wider background? One thing that separates Per-minute VoIP plans, which I like to call “On-The-Go-VoIP,” from traditional office plans which are mostly unlimited, is that the cost of a toll-free number is no different from the cost of a local number. You pay for the minutes anyway, so it makes sense to bill that way. eVoice gives you more numbers when you get more expensive plans. The $12.99/mo plan includes 300 minutes, 2 extensions, and 6 numbers. The $29.99/mo plan includes 1,000 minutes, 5 extensions, and 15 numbers. The $49.99/mo plan includes 2,000 minutes, 10 extensions, and 30 numbers. The $79.99/mo plan includes 4,000 minutes, 15 extensions, and 45 numbers. If you want more numbers, you can’t get them one at a time, you have to upgrade to the next tier. Additional minutes are a flat $0.039/minute; according to eVoice, fewer than 8% of customers ever pay overage charges. There is a $30 one-time number to activate a vanity number. Number porting is free. RingCentral gives you only one number by default. The $9.99/mo Pro plan is 300 minutes, and includes 2 extensions. The $19.99/mo ProPlus includes 1,000 minutes and 5 extensions. The $24.99/mo ProPower includes 2,000 minutes and 10 extensions, and then includes an additional 1,000 inbound toll-free minutes. ProPlus and ProPower include a dial-by-name directory. RingCentral does not offer a 4,000 minute plan, but if you add 1,000 minutes to their ProPower plan, it will be an additional $39, which brings the cost of 4,000 minutes to $63.00, which is less than eVoice. Additional numbers are $4.99 each, which can be local or toll free. ProPlus and ProPower give you a dedicated fax number, so you can count that as a second number free. You can add extensions one at a time for $2.99/mo each. Vanity numbers are a $30 one-time fee to activate. Overage minutes are $0.49/min for Pro, $0.044/min for ProPlus, and $0.039/min for ProPower. Number porting is free. eVoice has some additional features available for a premium. They offer Voice-to-Text transcription for $1.95/user for 40 messages, $5.95/user for unlimited basic transcription, and $29.95/user unlimited premium transcription. Call recording is $5.95/mo for manual call recording, or $8.95/mo for automatic recording. Recorded calls are saved for 30 days. Web conferencing, which includes audio and desktop sharing for up to 2,000 participants, is $9.95 for 100 minutes or $19.95 for 300 minutes with additional minutes $0.10/min. Unlimited web conferencing is available for $49.95/mo. You can also have text messages, which is actually something RingCentral is known for, for $4.95/mo for 150 messages a $0.10/msg thereafter, or $9.95/mo for unlimited texting. 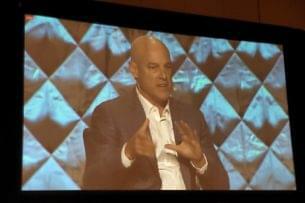 RingCentral integrates with Box online storage and Zendesk CRM. The integration is free, but the service comes from those companies. Other than that, RingCentral Professional does not offer any premium features that I have not mentioned yet. You can get additional virtual extensions for $2.99/mo. Additional fax, toll free, or local numbers are $4.99/mo each. A vanity number is a $30 one time fee. 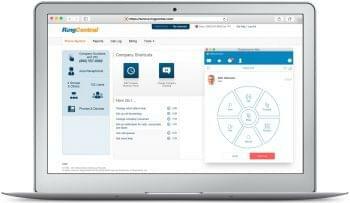 While RingCentral offers many advanced features like online HD web conferencing, those features are reserved for RingCentral Office subscribers, which are a separate service plan. RingCentral users can customize days and hours with specific routing rules. Calls can be routed, depending on the time of day or the number being called, to different phones. You can also set VIP rules so that only certain numbers can reach you during off hours. EVoice has the same call routing features. You can also make caller-, dialed number- or time-specific rules, and can set VIP rules so that only certain numbers can reach you in off hours. You can create profiles and schedules on both providers, to easily change around what agents are available at what time. 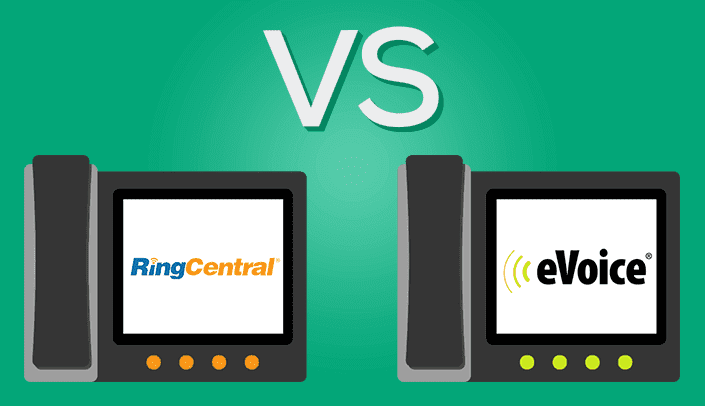 In this respect, RingCentral Professional and eVoice are exactly the same. eVoice has good options for greetings and prompts. The greeting, which is the first thing the caller hears when he or she dials the number, can be the system default, a text-to-speech message, a personally uploaded message, or a professionally-recorded message. The professional message which is free, can be a maximum of five words and be up to fifteen seconds. The free professional greeting is a good bonus. If you want to have a professional read a longer message, it is $25 for a message that is 125 words long, and another $5 for every 25 words longer. You can even record languages other than English. RingCentral also offers good options for greetings and prompts. You can have a default message from the promp library, program your own, upload a message yourself, or have a message professionally recorded. RingCentral partners with Snap Recordings to have their talent record messages for you. You have your choice of over 80 male or female voices, in English (US, UK, Australian, and Canadian accents available) French, or Bilingual English/Spanish. You can get a single message or up to 75 words for $50, or two or more messages for $100 for the first 150 words and $50 for each 75 words thereafter. You can also get one of five on-hold messages, which include music plus breaks for messages. A two minute, 200 word message is $135; 3 minute, 300 word message is $175; a 4 minute, 400 word package is $215; a 6 minute, 600 word message is $285; and an 8 minute, 800 word message is $340. Also, you get script suggestions to help you decide what to say. Without a web conference package, you can still connect multiple callers on both services. eVoice lets you connect with 94 other callers, which is accomplished by having everyone dial in to the same number. You can set the voice options to let callers be able to talk or only be able to listen. The RingCentral desktop softphone lets you add up to four callers to an existing call, or split the calls at any time. For both providers, minutes are billed per person per line. So, if you have a one minute conversation with three other people, it is counted as three minutes. Fax services are included with RingCentral Professional. The Pro level gets one phone number for both calls and faxes, and the ProPlus and ProPower get a dedicated fax number. You can still receive faxes on your main number, though. In addition to being sent and received as email attachments, faxes can be sent and received from popular cloud-based storage services, including Box, Dropbox, and Google Drive. You can use the app, send from your desktop, or send directly from Microsoft Outlook. You can send faxes out to one person or make group faxes. A number of formats are compatible with the paperless fax, including Word documents and Adobe PDF. You can also send legacy paper faxes with the help of an adapter. RingCentral faxes can be sent to or received from any fax number worldwide. eVoice uses its sister company eFax as an add-on for paperless faxes. The paperless fax service is a $1.95 add-on, and then each fax page sent or received is counted as 1 minute against your service plan. Faxes are sent and received as email attachments, which are sent from the eVoice portal. You can send a fax to one or multiple recipients. Both eVoice/eFax and RingCentral send you a text alert when a fax comes in. International faxing is available for a premium, if you contact customer service. 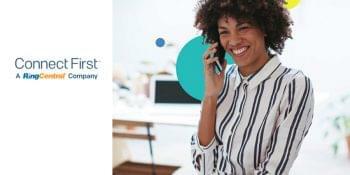 I believe, in my expert opinion, that RingCentral Office, the sister plan to the one we review in this article, is one of the best plans for any business that receives a lot of toll-free calls. RingCentral Professional, fittingly, includes an extra 1,000 minutes in their highest plan. So, if you’re looking to receive a lot of calls, RingCentral should be at the top of your list. What eVoice brings to the table is more features included at lower tiers that RingCentral holds out for their Office subscribers. You can see the difference in philosophies when you compare eVoice’s impressive 95-participant conference call to RingCentral Professional’s paltry 5-way softphone-only conference call. RingCentral has a number of integrations that make it a smart choice. Including their fax service, they play nicely with Box, Dropbox, Microsoft, Google, and Zendesk. eVoice is really only compatible with other J2 companies, like eFax. eVoice does so voicemail transcriptions, which is something no RingCentral plan offers. RingCentral also routes to ten numbers, eVoice, like most providers, gives you three, which is enough for your home, office, and cell phone. I don’t know that you need more than three phones, but if you do, RingCentral is the clear choice there, too. eVoice certainly does offer far more phone numbers. If you are looking to have lots of numbers to reach you, eVoice is the clear choice, but if you only want your business to have one or two numbers, and keep everything under the same umbrella, go with RingCentral. Stacking up the data, I think RingCentral Professional wins on price and features. Even if you go far over the expected number of minutes with the ProPower plan, it will be a while before you hit $80 which is the price of eVoice’s top tier. RingCentral also has, well, RingCentral, behind them, so if you find you want the advanced features of RingCentral Office, they’d be happy to have you. Unless you need a lot of numbers, or find yourself making a ton of conference calls, RingCentral Professional is the better choice of the two.